The arguments over what Jeremy Clarkson did and said to cause the BBC to pull the last three editions of Top Gear and carry out a disciplinary hearing have not subsided: indeed, after the Mail On Sunday’s suitably creative interpretation of what they were told by an allegedly “senior executive” at the Corporation, if anything the amount of heat-not-being-reflected-in-light has increased. 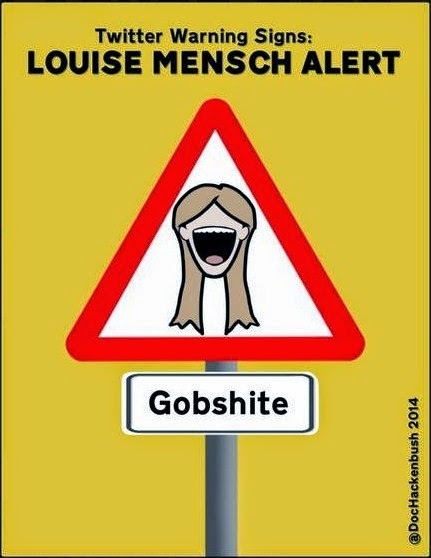 And shedding no light at all on the saga from her perch in reassuringly upmarket Manhattan has been (thankfully) former Tory MP Louise Mensch, who by the most fortunate of coincidences has been on-message with all the rest of Creepy Uncle Rupe’s obedient hacks and pundits. The Sun is hidden away behind a paywall, but a Zelo Street regular has taken a shot of her column (see how that works, Rupe?). From this, it is clear that Ms Mensch is trying to suggest that Jezza and producer Oisin Tymon are equally to blame, which is most interesting, given she was 3,000 miles away at the time. “Jeremy Clarkson is right-wing so the BBC is looking for any excuse to ditch him” she trills. Er, John Humphrys (Daily Mail regular), Andrew Neil, Melanie “not just Barking but halfway to Upminster” Phillips? But, as the man said, there’s more. “Scottish comedian Brian Limond … can scrawl ‘die now’ across a picture of Margaret Thatcher and a red line across her throat, and no discipline takes place”. And, as Jon Stewart might have said, two things here. One, Limond apologised for that, so there may well have been disciplinary action, or at least the prospect of it. And two, the only MP complaining about his actions was called, er, Louise Mensch. Remember? Then we get to the main event: “So he took a swing at a producer? Time was, the answer would have been to step outside and take a swing back … Can’t the two of them settle it privately?” See, they’re both at fault! Tymon is clearly fearful of losing his job, which, something that seems to have escaped Ms Mensch, he would be instantly liable to do if he “stepped outside and took a swing back”. But the worst is kept for last. “The anger at the BBC is over its double standards. It protected itself when it came to Jimmy Savile but it is forever trying to unseat a white, right-wing male the country adores”. Er, hello Louise? Jimmy Savile, back in the day, was a white, right-wing male the country adored. He was confirmed in this status by none other than Mrs T herself. While your paper is kicking the BBC for allegedly comparing Clarkson to Savile, you are actually doing just that yourself. With friends like you, Jezza has no need of enemies. Can she dig herself in deeper? You betcha, says Sarah: “It Clarkson is fired or quits he should go into politics … He’d make a great Tory MP - Minister for Transport?” Yeah, right. Like Jezza would forego the opportunity to trouser More And Bigger Paycheques For Himself Personally Now so he can be just more constituency cannon fodder. Remember, Louise Mensch was allowed to become an MP. There may be others. A news' report about Savile from just over a month ago. "Jimmy Savile was given free rein to sexually abuse 60 people ..... at Stoke Mandeville hospital due to his gold-plated status as a celebrity fundraiser ..."
"Lampard said that part of Savile’s status and influence that allowed him to abuse was as a result of encouragement from politicians, senior civil servants and NHS managers." "Savile’s association with Stoke Mandeville dates back to 1969, when he began work as a volunteer porter and star-struck managers gave him unrestricted access to the hospital grounds. The DJ immediately “caused annoyance and distress” to junior staff because of his constant sexual innuendo, the report found, but he was feted by senior managers." "In 1980, Savile’s grip on the hospital tightened when government ministers appointed him as chief fundraiser of the new National Spinal Injuries Centre (NSIC). This had the consequence of the hospital becoming dependent on Savile’s funds for 20 years and allowed him to attack a new set of victims in young fundraisers." - the institutions were very dependent on him for their income. So, Louise Mensch thinks that this is about the BBC's double standards. I think that it is more about trying to ensure application of the standards that a large number of institutions (among them the BBC) failed to apply with respect to Jimmy Savile (many years ago). Of course the heinousness of Savile's actions are far worse, but those institutions have to start applying the standards somewhere. It is difficult for me to see how the BBC can fail to investigate if there has been a half-hour shouting match in a public place (as some stories imply) or that there has been an assault (as some other stories imply): it's reputation is at risk if it doesn't investigate. As Louise Mensch says, lots of people adore Clarkson. Lots of people adored Savile 30 - 40 years ago. There would have been big trouble if "Jim'll Fix It" had been taken off the air. And taking it off the air would have cost a lot of money? So does Louise Mensch think that society should ignore a rule-breaker if the country adores him/her? That was part of the Savile problem. Or is she arguing something else? Anyway, I think he'd make a much better Minister of Education. Don't laugh, if anyone can get teenage lads to take reading seriously it's him. Boys, girls, whatever... There is a huge skills shortage in STEM subjects and to hear this man speak about Brunel, out of his Sunday night character, could inspire the next generation of engineers.